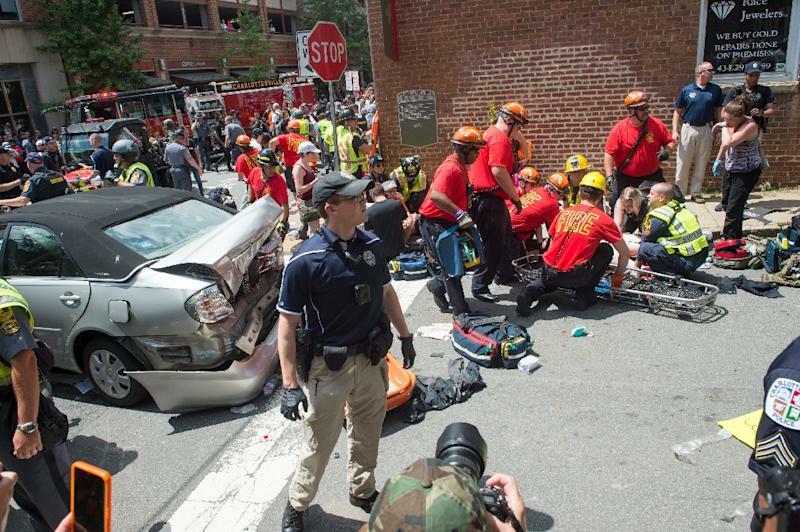 Washington (AFP) - Police in Portland, Oregon braced for violence at a rally Saturday by two far-right groups that has raised fears of a replay of last year's deadly "Unite the Right" protests in Charlottesville, Virginia. "It is particularly troubling to me that individuals are posting publicly their intent to act out violently," Ted Wheeler, mayor of the Northwestern US city, said in a statement Friday. "We don't want this here." Patriot Prayer and the Proud Boys, right-wing groups linked to violence at a previous Portland rally, planned to march in the city's Tom McCall Waterfront Park in support of Patriot Prayer founder Joey Gibson, who is running as a Republican for the US Senate. Meanwhile, a group called Popular Mobilization is organizing a counter-demonstration at the park, accompanied by a marching band and protesters in clown costumes. On the event's Facebook page, organizers said they "make no apologies for the use of force in keeping our communities safe from the scourge of right-wing violence." Riana Goren, an analyst with the Anti-Defamation League, told HuffPost that discussion about confronting counter-protesters has been taking place online "for weeks." Police have warned protesters to leave their guns at home even though holders of valid Oregon concealed-handgun licenses are permitted to carry their weapons at the park. They said police will screen people for weapons at entrances to the park, and explosive-sniffing dogs will also be brought in. "The potent combination of bigotry and violence on the streets of Portland poses a serious threat to community safety, and particularly to residents who are people of color, women and LGBTQ," said a statement from the Western States Center, signed by around 40 activist groups. According to the Southern Poverty Law Center, a non-profit group that monitors extremism, Patriot Prayer and the Proud Boys have appeared together at several rallies in the Pacific Northwest since 2017. A rally on June 30 was declared a riot and shut down by police after marchers and counter-protesters clashed, leaving several people injured.